Want to have a royal feel? Well, nobody would deny the opportunity! Moreover, who would not love the look of the jewel-studded reels that can actually help you to buy some beautiful jewels through the enormous payouts that they yield. Queen of Riches slots flaunts about 2 of the bonus features, one is the full reel wilds feature and other is the Reel Clone feature. The players are well delighted through these unique features. Big Time Gaming is an Australian-based company. This company has only 10 slot games to its cadre of games, still, it has managed to leave a mark on the casino gaming industry across the world. All their games are available in more than twenty different languages. Over the time, the company has developed different online versions of famous games like Blackjack and Roulette. 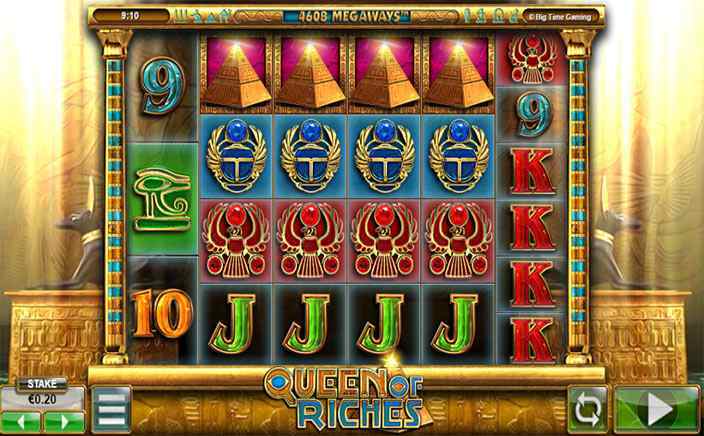 Queen of Riches slots has a 6×7 grid set. There are 7 symbols on each reel. Like in most slots, this slot doesn’t have paylines. It has 117,649 MEGAWAYS to win. The betting range begins from £0.20 and the maximum is £40. Egyptian Queen acts as the wild of the game. The symbols are all based on the Egyptian theme including Eye of Horus, Scarabs, and Ra Jewels. The wild gives a 7x multiplier if a payline is formed through this wild. The wild replaces all the symbols in the reel and makes the full reel wild. Making a winning combination using 2 wild reels, a 49x multiplier is generated for you. There is the pyramid symbol which gives a nominal payout when you get 2 of them adjacent to each other on the reels. Then there are six playing card symbols from nine till Ace. Reel clone feature entails identical reels being produced randomly during the feature. Up to six identical reels are created during this feature. The full wild feature also assists you to make huge winning combinations for you during the Reel clone feature. 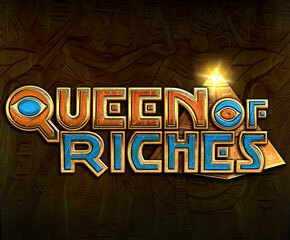 Queen of Riches slots coming from a small scale developer has really raised ears due to the awesome features and simply yet interesting gameplay it offers. So, you need not wait for anything to play this slot, just go on and bring yourself the riches it has to offer.